This delicate and beautiful wedding fascinator has a base of goose feathers with fluffy ostrich and long strands of burnt peacock. 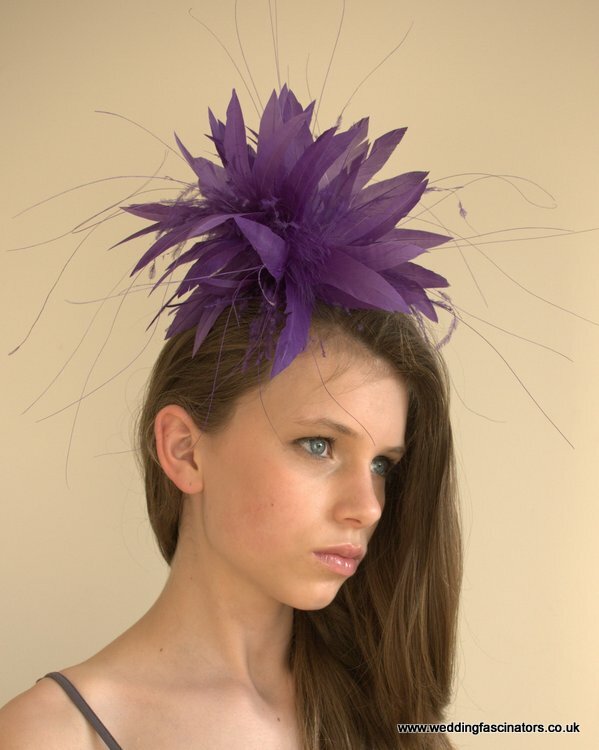 This small yet gorgeous fascinator is sewn onto a see through comb and can be worn on either side of the head. Other than the two colours shown which are Purple and Riviera Blue, the Knightsbridge style is also available in Almond; Aubergine; Black; Blackcurrant; Chocolate; Daffodil; Dark Heather; Deep Rose; Emerald; Forest Green; Gold; Heather; Honey; Ivory; Kingfisher; Lime; Magenta; Navy; Olive; Pale Pink; Sage; Sapphire; Scarlet Red; Silver; Steel Grey; Teal; Turquoise and White. Please email me if you would like more advice on these colours.